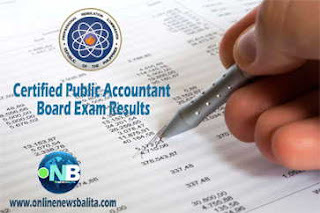 CAVITE, Philippines – The Professional Regulation Commission has released the list of passers for the recently conducted Certified Public Accountant Examination. The May 2017 CPA licensure exams were administered by the Board of Accountancy headed by its Chairman, Joel L. Tan-Torres and its members, Eliseo A. Aurellado, Gerard B. Sanvictores, Gloria T. Baysa, Concordio S. Quisaot, Arlyn Sicangco-Villanueva, and Samuel B. Padilla on May 14,15,21, and 22, 2017 at PRC testing centers in Manila, Baguio, Cagayan de Oro, Cebu, Davao, Iloilo, and Legaspi. Here are the lists of the successful passers for the recently conducted May 2017 Certified Public Accountant Board Exam. For the new Certified Public Accountant, registration for the issuance of Professional Identification Card (ID) and Certificate of Registration will be done on-line. Please go to www.prc.gov.ph and follow instructions for initial registration. To register, the passer should personally sign in to the roster of registered professionals. In October 2016 CPA licensure examination, five thousand, two hundred forty-nine (5249) out of fourteen thousand, three hundred ninety (14390) or 36.48% of the examinees had passed the said exam. Vhinson Jay Samson Garcia of the Wesleyan University Philippines – Cabanatuan City topped all the passers with rating of 94.33. Daryl John Sarmiento Punzalan got the second place with 94.17. Patricia Mae Dabu Munoz garnered the third rank with 93.33. The University of the Philippines- Diliman (UP) got 100% passing rate followed by the University of Santo Tomas (UST) with 90.72%, De La Salle University- Manila (DLSU) has 88.66% rate of passers. In the previous exams, results were released five (5) to eight (8) days after the last day of examination. NOTE: We will update this page every time so please dont forget to save this page in your bookmark. We’re also encouraging you to try our interactive comment section and communicate with other examinees. “Pambawas kaba” as you know. Goodluck!